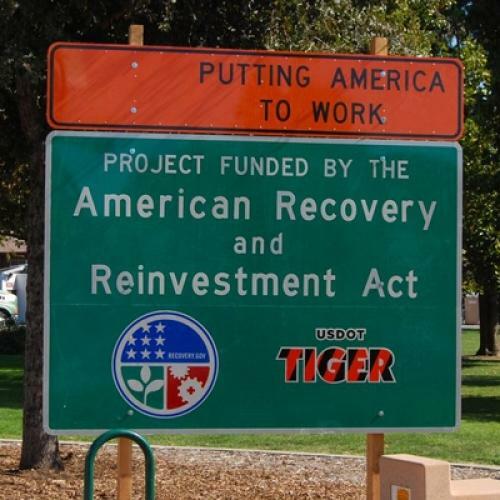 The Obama Administration determination to avoid describing their new economic stimulus as a "stimulus" has been comical. And logical. Most economists believe the stimulus created and saved millions of jobs, enough to help keep the country out of a true depression. But the word stimulus has become politically toxic. ...the very things that made the stimulus more effective economically may have made it less popular politically. For instance, because research has shown that lump-sum tax refunds get hoarded rather than spent, the government decided not to give individuals their tax cuts all at once, instead refunding a little on each paycheck. The tactic was successful at increasing consumer demand, but it had a big political cost: many voters never noticed that they were getting a tax cut. Similarly, a key part of the stimulus was the billions of dollars that went to state governments. This was crucial in helping the states avoid layoffs and spending cuts, but politically it didn’t get much notice, because it was the dog that didn’t bark--saving jobs just isn’t as conspicuous as creating them. Extending unemployment benefits was also an excellent use of stimulus funds, since that money tends to get spent immediately. But unless you were unemployed this wasn’t something you’d pay attention to. For more on the under-appreciated virtues of the stimulus, I'd recommend (again) reading Mike Grunwald's recent in article in Time.